In this article I will explain ExecuteReader example in asp.net using C#.net and VB.NET. In previous post I explained ExecuteScalar Example, ExecuteNonQuery Example and differences between ExecuteNonQuery, ExecuteReader and ExecuteScalar in asp.net. Now I will explain ExecuteReader concept with one example in asp.net using C#.net, VB.NET. 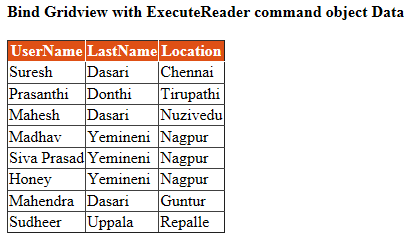 Execute Reader will be used to return the set of rows, on execution of SQL Query or Stored procedure using command object. This one is forward only retrieval of records and it is used to read the table values from first to last. If you observe above code I written select query like getting all the data from UserInfromation table but whenever we click on button we are getting only one value (First Row First Column value) and ignoring other row and column values. Hi suresh my name is praneeth. I learned various concepts from your blog regarding .net where the faculty of my institute(pvt) failed to explain each and every concept clearly. Thank you very much for sharing your knowledge with persons like me and it was helpful to me very much....! HI Suresh, Your blogs are a really too good. They have proved very helpful to me. Whenever I am stuck somewhere, i refer to ur blogs. then we have to open the connection but don't have to close it. Am I right or not ??? you are not even using 3 tier structure and didnt even use parameters... this is a poor example which will create lots of coupling..